Australians clean sweeped against Pakistan at Marrara last night winning the fourth and final test 5-3. Pakistan had scored only one goal in the first three matches , but came back with a stunning performance and too the early lead spearheaded by Abu Mahmood fired the ball past Australian goalkeeper Tristan Clemons the first time the visitors found quality field position. The early breakthrough brought the best out in the Aussies. They responded within two minutes on the back of a penalty corner. Pakistan blocked the initial threat, but couldn’t keep out Kiran Arunasalam, who picked up the scraps with a follow-up strike. Australia were awarded a penalty stroke five minutes before the first break. Captain Mark Knowles calmly slotted his shot past keeper Ali Amjad. Pakistan came back strongly and scored 2 goals in 3 minutes.Umar Bhuta levelled the scores as he pierced through the Australian defence skillfully. The next goal came from a piece of individual brilliance from Mahmood. He made a sizzling run from the halfway line, veered to the left then fired at goal from at an acute angle, past Tyler Lovell to give the visitors the lead. Trent Mitton locked the match up for the Aussies once more after he found himself on the end of a neat flick on from Aaron Kleinschmidt. 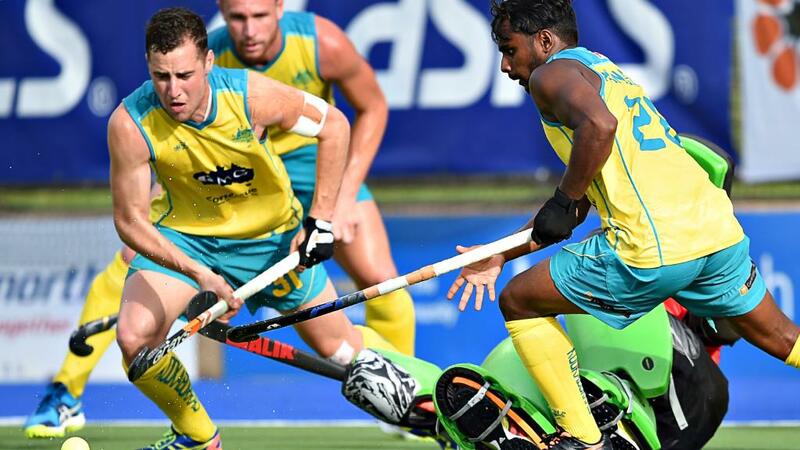 Kleinschmidt would be the man to clinch the lead back for the Kookaburras. The forward pounced on a block from Amjad, then passed it into an open net halfway through the third quarter.